From 1898 to 1920, automobile production quickly expanded. Light cars of that era were commonly known as voiturettes. The smaller cyclecars appeared around 1910 with a boom shortly before the outbreak of the First World War. The number of cyclecar manufacturers was less than a dozen in each of the UK and France in 1911, but by 1914, there were over 100 manufacturers in each country. Many of the numerous makes were relatively short-lived, but others became better known, often through racing success, this included names such as BÃ©dÃ©lia of France and both G.N. and Morgan from Britain. 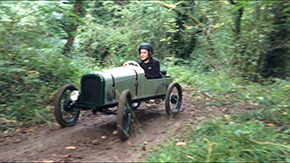 David Frank took his inspiration from GN “My particular one is based roughly around a 1920's GN 100 racer, with the shape being modified slightly to make it suitable for an adult to drive”. Using Autodesk Inventor David set about the design of his version of the GN. 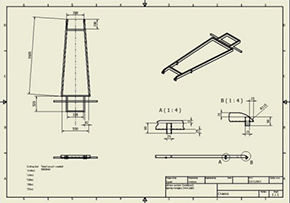 The software was used to set about designing the all-important chassis and steering, with associated engineering drawings being created at the same time.Â Using Autodesk Inventor, it was easy to determine the amounts of material that needed to be purchased, and to visualise the kart, ensuring the design was to the correct proportions before construction began. Steel was purchased from a blacksmith in a neighbouring village, along with the leaf springs, these being cut from one large horse and cart spring. 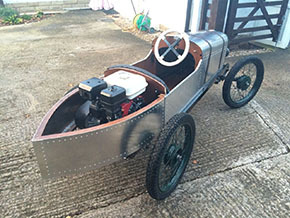 With the chassis designed and the materials purchased, David then started the manufacturing process, using the facilities in his dads workshop, he arc welded the chassis together, manufactured the machined components, Â Kingpins, bushes, and all the steering mechanism using the workshop Myford lathe and milling machine. Power comes from Honda GX 160 Go-kart engine, which David modified to reduce the weight. 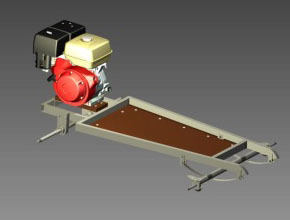 The transmission is through a variable speed belt drive, known as a torque-a-verter, with a chain drive to the back axle. Braking is a disk on the rear axle, with the calliper being salvaged off a scrap Go-kart chassis, with drive to both wheels, for better traction and braking. The wheels are Honda 90 moped wheels and were purchased from eBay for Â£30 in total, the chassis and running gear design was complete. 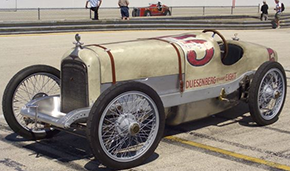 The CycleKart was tested extensively for a year as a rolling chassis, to iron out any issues, once it ran without issue, the cockpit was made from plywood with a metal framework, which holds the sheet aluminium body. 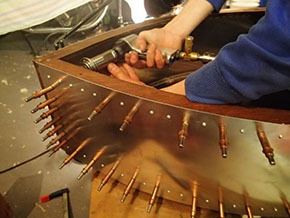 The main body panels were then riveted in place with the exception of the bonnet. This was bent by David, using no machinery, and then riveted to central hinge to allow the bonnet to be opened on either side. It is secured in place with leather belts. 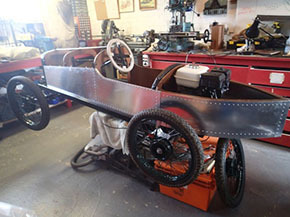 The completed CycleKart has taken over 500 hours to design and build, and now gives hours of fun to David and his pals. I am sure if the designers of the 1920 GN could see David’s efforts, they would be very pleased that almost 100 years on their designs are still being appreciated. One thing I forgot to mention the designer David Frank was only 13 when he started the design, and when he finished the project he was 15 years old.